A Letter From Philip Kapleau, Roshi to Yamada Koun, Roshi. Schedule of 10th Anniversary Celebration. Schedule and list of gifts to be presented to participants at the 10th Anniversary celebration. * 300 SETS OF SHIKISHI (REPRINTS) BY GEMPO ROSHI, NYOGEN SEHSAKI, AND SOEN ROSHI HAVE BEEN ORDERED. THE COST IS APPROXIMATELY $3,000. * THE SOEN ROKU; 1000 COPIES WILL BE PRINTED FOR ABOUT $6,000. * FINE SHINO TEA BOWLS IN WOODEN BOXES. 250 HAVE BEEN ORDERED. EACH COSTS $50. THE TOTAL EXPENDITURE WILL BE $12,500 PLUS POSTAGE AND HANDLING FROM JAPAN. * 200 TEACUPS BY GEORGE PETERSON ($8 @) WILL BE DONATED BY AIHO (愛法). * PRINTING OF INVITATIONS AND SHOPPING BAGS. * GRATUITIES TO VISITING TEACHERS. A Letter of Gratitude to Kobutsu for a Non-Contribution to the Memories Section of the SŌEN ROKU. 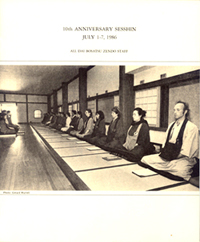 "Thank you for your contribution to the Memories section of the SOEN ROKU, which was first distributed on July 2nd at International Dai Bosatsu Zendo Kongo-ji as a part of its Tenth Anniversary celebrations. A copy of the SOEN ROKU is sent to you under separate cover with the compliments and deep appreciation of Eido Shimano Roshi, Abbot. "One day, Kobutsu was working alone in the monastery basement, crawling around in the pipes that run along the ceiling. There was no one in the basement, and Kobutsu was waiting for a drop of water to show up on the stem of a leaky valve that he had just tightened. Soen* Roshi walked, no, sort of scuffled slowly into the room. He was obviously in a samadhi state as was Kobutsu up on the ceiling. Since Kobutsu's Samadhi was imperfect, he was distracted by the Roshi's approach. Being mindful, and not wishing to disturb the Roshi, he did not make a sound. Consequently, the Roshi was apparently unaware of Kobutsu's presence." Thie story, as it was written, was about an encounter with Eido Shimano not Sōen Roshi. It was given as a gift to Shimano. Minutes of ZSS Board of Trustees Meeting. "Expenses, including gratuities to participating dignitaries, gifts, shipping, invitation and program costs, guest transportation, and many items more, totalled $36,626.07." "David Schnyer reported receipt of a $50,000 contribution (earmarked for the guest house) from Laurence Rockefeller;"
"Certain expenses such as publishing costs for the Soan Roku book, food and refreshments July 2, and photography totalled $7,084.01"
"Finally, Eido Roshi (嶋野 栄道) reported that 10thAnniversary contributions for events taking place on July 2 (also some in connection with the Japan Society event June 30) had totalled $35,349.56." Minutes of ZSS Board of Trustees Annual Meeting. Memorandum from Jikei Jean Bankier to ZSS Board of Trustees. Letter from Jikei Jean Bankier to Genro Lee Milton. Letter requesting confirmation in writing of resignation. “It was agreed that Clark Strand be sent to New York Zendo as resident and that the present Committee be disbanded and a new Committee be organized. Mrs. Shimano, Jean Bankier and Wllkie Pretorius would remain on the Committee and Bernard Spitz and Clark Strand would join them. Eido Roshi (嶋野 栄道) would invite additional Committee members." Eido Roshi's (嶋野 栄道) plans for the future. Letter from Junpo Denis Kelley to ZSS Sangha. “Eido Roshi (嶋野 栄道) has recently expressed the need for a leave of absence for rest and revitalization so that he can continue his work in America with renewed vigor. “Wilkie Pretorius then read the statement of purpose from the original by-laws of the Zen Studies Society: ‘The purpose of the Zen Studies Society, Inc., is to undertake the study of Zen Buddhism in its religious, philosophic and psychological aspects, its influence on Oriental cultures, its relation to world religions and philosophies, and its relevance for the life of modern man.’ "
"First International Exchange With Shôgen[ji] Zen"
Letter from Bugyo David Schnyer to Hozo Wilkie Pretorius ZSS Board President. Bugyo David Schnyer's Letter of resignation from ZSS. 19910114_Pertorius_Schnyer.pdf Letter from Hozo Wilkie Pretorius ZSS Board President, to Bugyo David Schnyer. Acknowledgement of receipt of resignation letter. Reference to the Board of Trustees as "The Board of Directors." Letter from Jikei Jean Bankier to Shingo John Brady. annual Board meeting to be held on March 1st. List of DBZ residents 1992. A Letter from Kobutsu Malone to Eido Shimano Concerning Shimano's Theft of a Kan 環 (Ring) Intended as a Gift to Junpo Dennis Kelly. 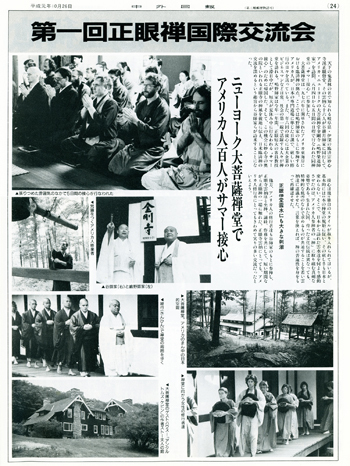 The announcement of the completion of the Inka ceremony held for Junpo (巡法) Kando Denis Kelly at Dai Bosatsu Zendo on October 10, 1992. This memo to Junpo Denis Kelly is from a man, serving as a financial advisor to DBZ, who would soon discover he was the fiancé of a survivor. The name and identifying information of a survivor has been redacted from this document. "Financial matters to discuss with attorney." Dai Bosatsu Zendo Profit and Loss Report. Year end profit and loss report for DBZ. Letter from Xxxxx (Survivor's Fiance) to Shimano. “You risked weakening of your life’s work. What a callosal [sic] price to pay." ”貴方は、八日から十日に渡り、女性同伴の夜を、Xxxxxxx　と共に過ごし大いに危険を犯しました。　第一に、貴方は彼女の心の平安を危うくしました。　この事による彼女の苦痛を、私は思いやります。　彼女は、結制のためにDBZへ行ったのであって老師の妾になる為ではなかった筈です。"
Letter from Survivor Xxxxxxx to Junpo Denis Kelly. "I [survivor] am still too embarrassed and fragile to talk to him [Shimano (嶋野)]. But [survivor's fiance] and he [Shimano (嶋野)] had some very heart felt talks. Roshi (老師) owned 100% responsibility, was concerned about my welfare, and was open to seeing his stuck place in this patriarchal system. He was very open with [survivor's fiance]. But his main fear was that his wife would find out!" Letter from Survivor Xxxxxxx to Shimano. "So, you can understand the intensity of my distress at having to keep our affair a secret from the people whom I love. When I told you my distress about our relationship and you told me to lie, I was devastated! I was caught in the position of either telling this secret and 'getting you into trouble,' or keeping it inside me and feeling very emotionally and physically ill."
"However, I am still upset about this whole matter of deceit. Because you have been in this same situation with other women in the past, the emergence of the truth here may have some far-reaching consequences. People will question your integrity, honesty and purpose. I do not intend to cause trouble for you. I care about you. But I am upset about the element of deceit you required me to maintain." Thirteen pages of proposed by-laws. “There shall be at least six (6) directors, each of whom shall be at least eighteen years of age. The number of directors may be increased (or once increased, it may be decreased) by an amendment to these Bylaws passed by an affirmative vote of a majority of the Board of Directors. 'Entire Board of Directors' shall mean the total number of directors entitled to vote as if there were no vacancies. The Board shall not have the power to reduce the Board of Directors to less than six (6) persons; nor shall it have the power to decrease the number of directors so as to shorten the term of an incumbent director. “In case the Abbot has more than one dharma heir, the Abbot should clearly indicate the order and status of each in the line of succession to the abbotcy [sic] of the Zen Studies Society. Letter from Three DBZ Executive Committee Members to the ZSS Board of Directors. "The Executive Committee of Dai Bosatsu Zendo has received Junpo-Shi (巡法) Denis Kelly's resignation. His contributions, although at times controversial, helped the monastery grow." "We were disturbed and saddened to hear about Roshi's (嶋野 栄道) affair with a Kessei student and are worried about the repercussions of this matter. We hope that together we can encourage Roshi (嶋野 栄道) to resolve this situation honestly. 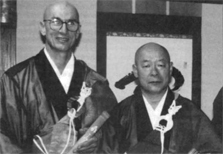 We feel it in the best interest of Zen Studies Society, Shobji and Dai Bosatsu Zendo, to encourage the Board to ask Roshi (嶋野 栄道) to return from Japan as soon as possible." Letter of Resignation from Dharma Heir, Junpo Denis Kelly to ZSS Board of Directors. "Today, with deep regret, profound sadness and genuine concern, I resign as Vice Abbot and Head Monk at Dai Bosatsu Zendo." 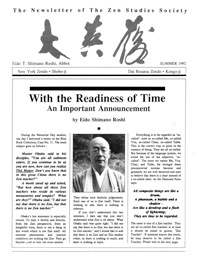 "After two weeks of deep and anguished soul searching I find that Eido Roshi (嶋野 栄道) and I are diametrically opposed on two critical, irreconcilable issues: the first being Buddhist ethics or precepts, and the second being the philosophy of teaching"
Minutes of ZSS Special Board of Directors Meeting. The name of a survivor has been redacted from this document. “Kelly read his letter of resignation (copy attached), and added that he and Eido Roshi (嶋野 栄道) was [sic] of similar character, lacking ethical and moral standards. However, in October 1992, upon receiving transmission, he had to face what it meant to defend the dharma and he wanted to change. Eido Roshi was not willing to do the same, and Kelly "therefore requested the board to consider not allowing him to teach. 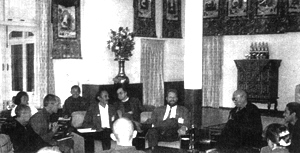 Letter from Muin Bernard Spitz to ZSS Sangha. Letter from Tashi Linda Baylor to ZSS Board of Directors. "Sensei Bodhin recently attended a conference of twenty-two Western Buddhist meditation teachers in Dharamsala India, that included four days of meetings with the Dalai Lama. The participants were all raised to North America and Europe, but many have spent large portions of their adult lives practicing Buddhism in Asia. Almost three quarters of the teachers were of the Vajrayana (Tibetan Buddhist) tradition. There were only a half-dozen monks and nuns and only five women, though five others had been invited. Most of the teachers had about twenty years of practice behind them, some in more than one of the Buddhist traditions. In addition to the teacher-participants, there were some Western observers, including Sank Poromaa, leader of our Stockholm Zen Center. Two generous Sangha patrons, concerned with the toll that two months of sesshin and heavy travel might have on Sensei, sought out someone who could accompany and assist him. The day before his departure, they found Sank available and eager to go. What follow are some of Sensei's most memorable impressions and reflections on the conference, focusing on the four days with the Dalai Lama. Following Sensei's article, we are publishing an open letter which arrived recently from The Network For Western Buddhist Teachers, formed by the participants at the conference. It summarizes the major points of agreement on matters covered in the conference." A Report by Daichi Vasken Kalayjian. "Many have called this sexual misconduct, and legal opinions view this as sexual harassment. I view it as a mistake that we all should find in our hearts to forgive." "I tend to agree that in order to change what appears to be behavioral patterns, one needs professional assistance." Fax from Douglas L. Leight, Ltd. to Daichi Vasken Kalayjian. "We are an actuarial and benefits consulting firm specializing in the design installation and administration of qualified Employee Retirement plans, and non-qualified Executive Compensation plans."